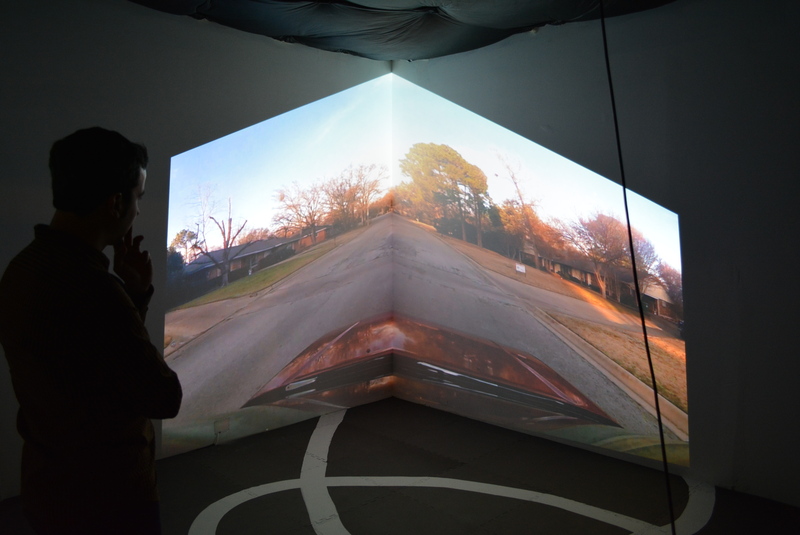 Last Friday, I went to the Dallas Contemporary to support a fellow student in the Student New Media exhibition. 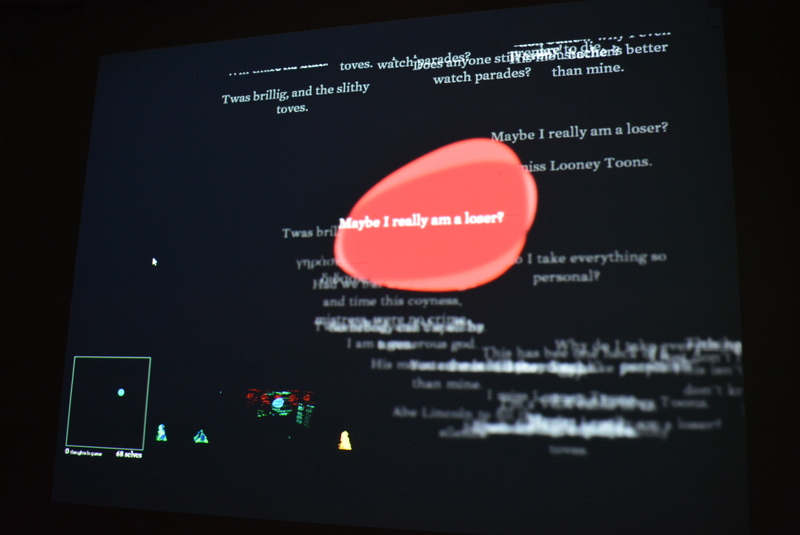 This exhibit partnered up with creative departments from UTD, UNT, and SMU focusing on interactive art and technology. Upon arrival, I was pleased to see a variety of projects. 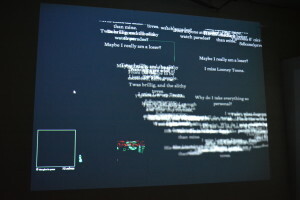 Jay Ray and Will Broderick’s piece, Self vs Other, used programming and scripting languages such as node.js as well as a microsoft kinect to detect movement, which was really interesting. 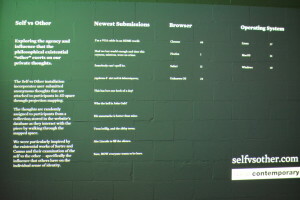 Users could submit anonymous thoughts to their website, selfvsother.com, which collected data such as operating system and browser type. 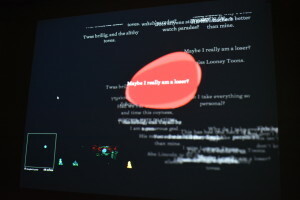 The submitted text would then pop up onto one of the three screens projected, triggered by movement from the kinect in the 3D space. There were a lot of complex variables working together in this piece, which made it very thought-provoking. In the middle of the DC space, there was an enclosed room with a projector sitting on a dolly-like cart. After speaking with the artist, this piece became one of my favorites. 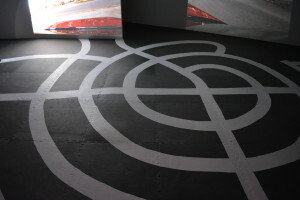 The artist, Julie Libersat, displays her interest in visual disorientation in her piece Ridgecrest Spiral. This video installation is a simulation of driving through a small neighborhood that is mapped by thick lines on the floor. Participants must try and match the speed of “driving” the cart to the speed in the video, which can be surprisingly disorienting. The enclosed space had about five angled walls, which really helped distort the projection. This installation, while not as complex as the former, displayed a simple and clever concept while fully engaging the participants. 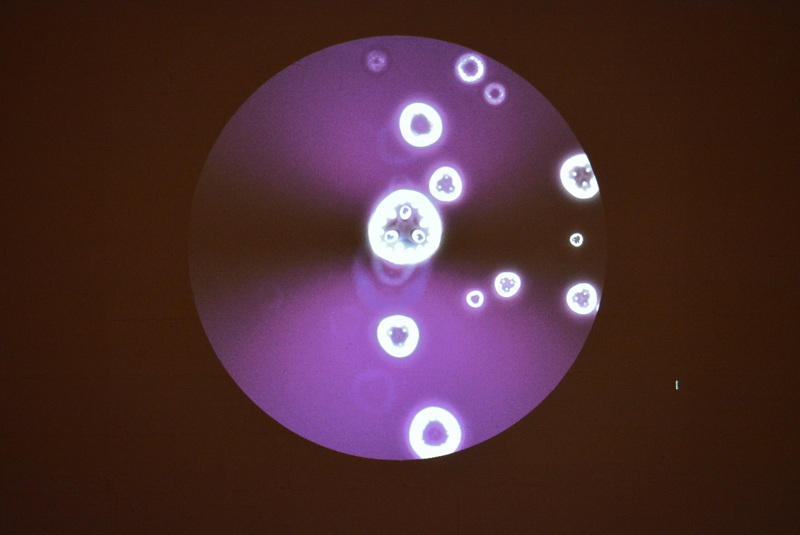 I also enjoyed Gabriel Vega’s installation, Corpuscle, which took the pulse of participants by placing a finger on an illuminated point of light. 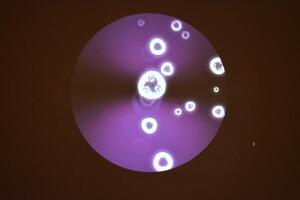 Once the pulse was detected, the petri-dish projection simultaneously pulsed with a purplish color. After asking him to explain his process, he explained that the cell movements are currently random and that his project is a work-in-progress; he eventually wants to enhance the prototype to detect and monitor skin cells for medical use. In spite of the DC’s questionable management, the exhibition itself was very inspiring. I currently have no concrete idea for my capstone project before graduation, so this was a gentle push towards a future goal.